Mother/Daughter team Marta Pequignot and Kate Sorgenfrei have a mutual respect for each other that compliments their combined talents and unique perspectives. True artists – and true friends – their dynamic teamwork and leadership guarantee the best experience in the fine art of custom framing. Experts in spacial design, specialty projects, fine art, presentation, multiple layout, and thinking outside the box. Meet our team! Our creative and talented staff (each with her own degree) is an artist in her own right. Together, we have the passion and the skill to understand your unique needs and bring your vision (and your art) to life. Marta is the owner of Frame Art & Design. She attended the Fort Wayne Art Institute from 1975 to 1981 and earned her Bachelor of Fine Arts degree from Indiana University. Marta began picture framing while preparing her own art for a senior retrospective show for the Fort Wayne Art Institute. In 1990, she became a Certified Picture Framer with the Professional Picture Framers Association. 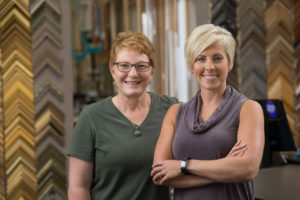 Currently, she is the ONLY certified picture framer in the Fort Wayne area. 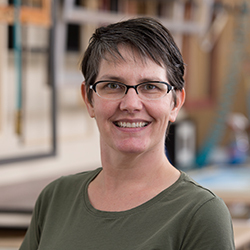 Kate has worked at Frame Art & Design since she was fifteen, so she says she’s, “been in the business all my life!” Kate earned an Associate of Science degree in Interior Design in 2003 from IPFW and specializes in art consultation for residential and corporate art. “When I’m not ‘working,’ I’m a full-time mom to two daughters and wife to my husband, Ross,” Kate says. 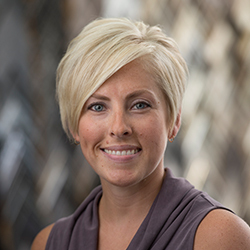 She loves coffee, working out, helping others, and watching her girls excel in their passions – providing a listening ear and discerning advice to them. 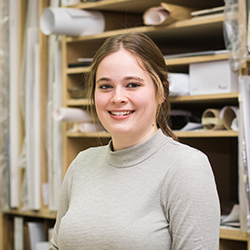 Abi has worked with Frame Art & Design since 2015, after graduating from Huntington University with a degree in Animation. She has a strong focus for color which helps when it comes to specifying the perfect mat color and frame for your art. She also does occasional freelance illustrations when away from work, constantly pushing to improve the design work. Abi has been strongly influenced by illustration arts and graphic novels as well as very colorful artists, such as Vincent van Gogh. She lives in Fort Wayne with her cat and PlayStation®. Nina first became interested in art while attending LaSalle High School in South Bend. She entered (then-named) Saint Francis College in 1993 on a small art scholarship, initially interested in drawing. But she soon fell in love with photography, which became her concentration, and she studied under noted photographer Karen Thompson. Nina started part-time here during her senior year, continuing (with time off to raise her first child) until she and her husband moved to Memphis in 2007. Around then, she acquired her first digital camera and delved into stock photography – enabling her to express herself in this art while earning an income and staying home with her daughter. It’s been a huge part of her life ever since. 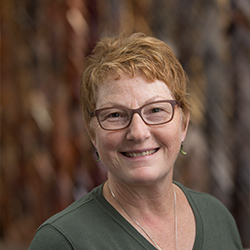 Nina is involved with most phases of production here, and she especially enjoys building frames and mounting more difficult pieces such as jerseys, christening gowns and other fabric items. 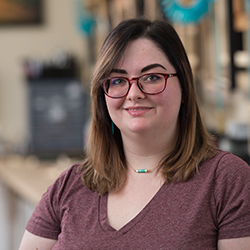 Emma received her bachelor’s degree in photography from the University of Saint Francis in Fort Wayne, Indiana, so, naturally, photography is her favorite artistic medium. She shoots with the intent of understanding the interaction of light, color and composition in everyday life. Emma is an integral part of the corporate art production, making sure every piece is displayed beautifully. She also provides custom fine art photography that is available for purchase for corporate and residential jobs. Along with that, she is also Frame Art and Design’s social media manager. Emma is inspired by the natural world around her, and her aesthetic often mimics the beautiful hues that can only be found in those environments. She enjoys taking in the great outdoors (camera in hand, of course), reading and also hanging out with her cat, Lilly.